For many IT workers remotely involved with networking, it is quite common to need to expose your Intranet application to the outside world in a secured manner. Unfortunately, we work most of the time from private IP networks, be that at the workplace, at home or at the coffee shop. The router(s) or firewall (s) that stands between our workstation and the internet makes it harder to expose a local socket to the outside. Most of the time, this is preferable for security. 1. Change your router / firewall configuration to do port forwarding or NAT from public to your application. But in many cases, you wont be able to make that changes or you even do not have that options. This post is going to explore some of tunneling services I am using. Note: Windows Ngrok is a command line tool. You will need to unzip it into a folder then use it from command line. On Linux or OSX you can unzip ngrok from a terminal with the following command. On Windows, just double click ngrok.zip. Most people keep ngrok in their user folder or set an alias for easy access. Running this command will add your account’s authtoken to your ngrok.yml file. This will give you more features and all open tunnels will be listed here in the dashboard. Following screenshots are captured from Windows OS. The output will list a forwarding URL, which will point to your local server. You’ll also see any active tunnels listed on the status page. 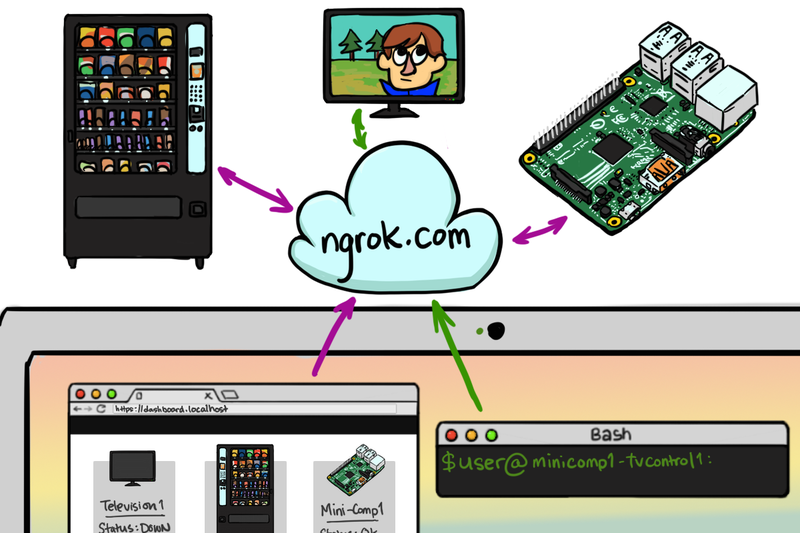 Note: free ngrok accounts receive a random URL each time a tunnel is started. Upgrade for other options. Starting ngrok normally will generate a URL with a random subdomain (e.g. abc123.ngrok.io) for your tunnel. However, upgraded accounts can configure reserved ngrok.io subdomains so they’re only available for use by their account. They can also enable custom domains to forward to their ngrok tunnels with CNAME records. frp is a fast reverse proxy to help you expose a local server behind a NAT or firewall to the internet. Now, it supports tcp, udp, http and https protocol when requests can be forwarded by domains to backward web services. 1. Deploy frps at server side. token = "your password which is same as server side"
This configuration means when we access our public ip’s 16316 port, it will forward the access to local computer’s 2222 port. So, FRP deployment is completed. Internal host’s 2222 port has been successfully exposed to Internet. Localtunnel allows you to easily share a web service on your local development machine without messing with DNS and firewall settings. Localtunnel will assign you a unique publicly accessible url that will proxy all requests to your locally running webserver. You will receive a url, for example https://gqgh.localtunnel.me, that you can share with anyone for as long as your local instance of lt remains active. Any requests will be routed to your local service at the specified port.